The #vitaehangout online event covered some really important topics: how to best go about setting up an online profile, actions to take when thinking about big career changes, how to find suitable positions and – of course – working towards funding applications. Did you know that men generally apply for jobs when they can cover 60% of the required skill set, whereas women generally apply when they can cover 80% or more? The panel suggested applying for roles even when you’re uncertain about how appropriate you are, in order to benchmark yourself. Especially if applying means you get some feedback. With funding applications, the panel suggested piggy-backing onto other more-experienced researcher’s funding applications to begin with: start out by contributing in whatever way you can in order to gain experience (just make you sure you are properly named and get the credit you deserve!). And always remember that a strong publication record is vitally important– concentrate on this first before even thinking about applications. Regarding making big career changes, the resounding response was don’t be ashamed, don’t be afraid. And don’t think that leaving academia makes you a failure- at all! Big changes are difficult for everyone, be it buying a house or starting a family. The panel suggested finding ways of experiencing different career options in a safe and low-risk way wherever possible, be that through contacting potential employers, or through Continual Professional Development opportunities within our home institutions. They also recommended getting in contact with people on a career path you’re interested in – get the low-down on what it’s like, and get some great advice before you commit yourself further. The idea of performing a holistic overview of the things you enjoy and are good at was raised. This makes sense- the organiser from Vitae, Katie Wheat, herself said how she discovered the idea of moving into researcher development by thinking about all the parts of her post-doc role she liked, and all the ones she didn’t like! I reckon this is all good food for thought. Many of the questions asked to the panel raised another important idea- having a strong strategy. 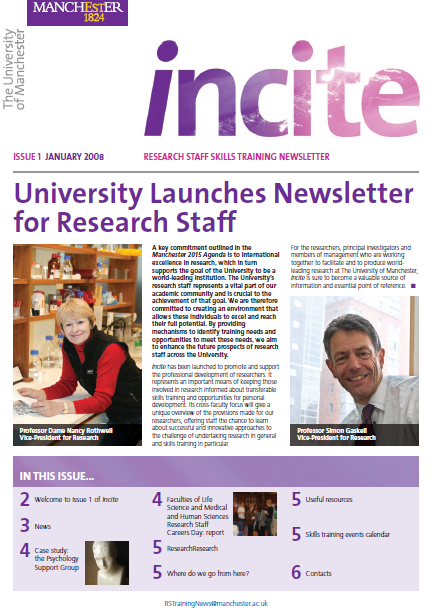 If we, as researchers, can have a vision for our future careers (see issue 17 of Incite for more on this!! ), we can start making preparations, we can start to network with the groups of people who could or will be influential on our future careers, and we can seek out mentors we’d like to emulate. A top tip on mentoring: the panel suggested having a chat over coffee first- there’s no need to label a relationship as “mentoring” until you’ve gotten to know someone a little first. Regarding online activity, the panel suggested we concentrate on the social media that makes sense to us. Research gate might be more suited to others, whilst some will prefer the immediacy and informality of twitter, or others will prefer the format of Linked In. There doesn’t seem to be a need to have strong presences on all social media– it all depends on which types of people you want to connect with most, and the best way of connecting with them. Concentrating on only one or two social media outputs also means we won’t lose all our time— after all, we still need to concentrate on publishing our research. Finally, the panel often stressed how useful it is to ask your colleagues about all these issues— be it career advice, funding ideas or suitability of roles. And it doesn’t have to be a highly experienced academic– our peers can be a great source of support and ideas as well.